Apparently their stout isn't bad either, so here's hoping I've picked a good beer. Wales isn't particularly famous for their beers but I've had a couple before and they aren't that bad, Brains Gold springs to mind as a decent drop. After having Black Tokyo Horizon I've developed a taste for stouts so I'm looking forward to this beer. I poured this beer into my recently acquired beer snifter. This glass is specially designed for Stouts and other aromatic beers with a tiny lip to help taste both head and beer at the same time. The beer pours a lovely black colour with reddish tints around the edges. It has a good sized tan head and is relatively opaque. The head disipates quite slowly to leave a healthy film on the surface of the beer, which laces the glass very well. 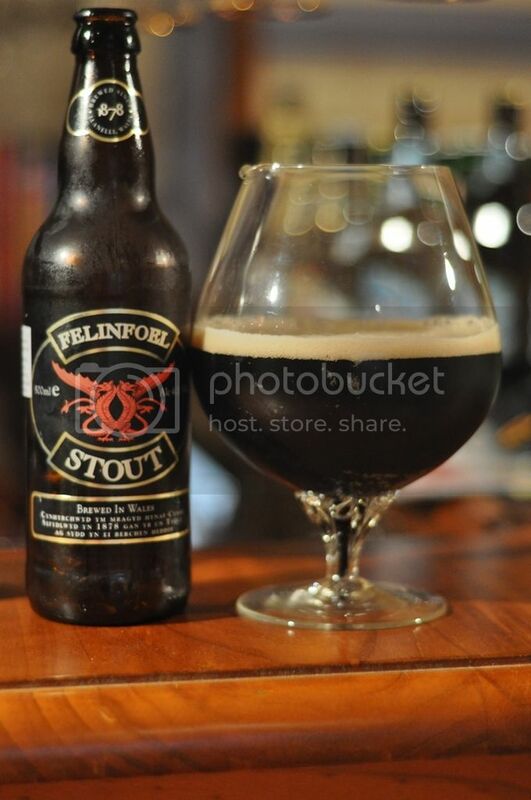 Brilliant looking stout! This beer seems rather fruity for an English stout to me on the nose. I get hints of apples, berries and bananas. There is also a distinct red wine odour, which seems oddly acidic for a beer. Some chocolately malts but nowhere near enough, however the roasted barley's listed on the back of the bottle smell magnificent. To me this doesn't have enough roasted malts on the nose to be purely classified as a stout, more a bock to my mind. Either way it still smells nice. There is something hard to describe about this beer, I can't quite put my finger on it but it seems more like a red wine than a stout to me. Quite a fruity taste with grapes the predominant flavour. There are more roasted malts than the nose let on but they are not the strong chocolately the bottle advertised. The slightly sweet apple aftertaste is slightly off putting. The body is rather thin and feels very light on the way down, at only 4.1% it's got very low alcohol and I really can't taste it at all. I like this beer however as stouts go it's not a particularly flavoursome example. If you are a stout purist this beer is not for you, because it's far too thin bodied and the finish is quite dry. However maybe as an introductory beer for people trying to get into stouts this could be a good place to start. The beer isn't overly malty and shouldn't offend even the most plain minded drinkers. If your interested, it's not particularly difficult to find.